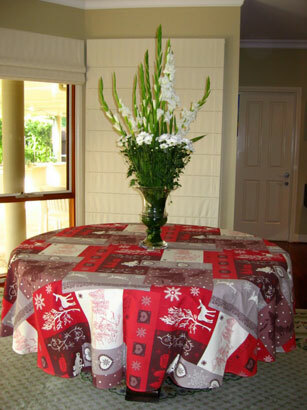 Custom made tablecloths is our speciality. 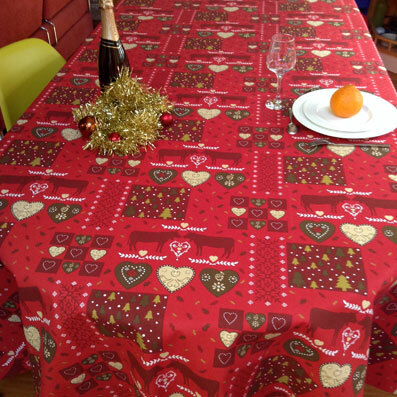 We make tablecloths to your dimensions and your needs: any shape and size cloth, fitted elasticized table covers, placemats, runners, ... Just email your dimensions. 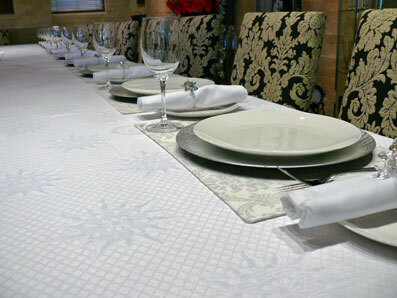 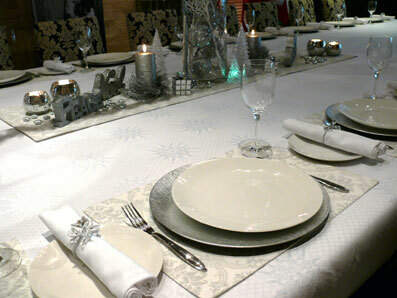 Made to measure table linen is our speciality. 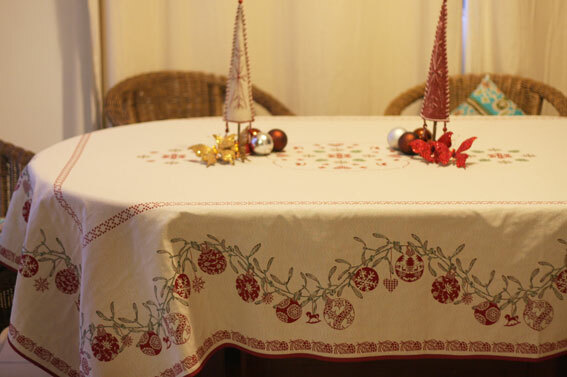 These tablecloths are over 7 m long and 2 m wide. 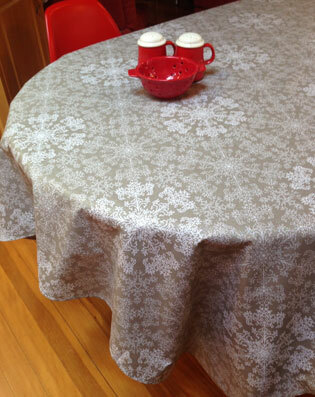 To make this acrylic coated very large rectoval tablecloth we joined two lengths of Irene coated Provencal fabric. 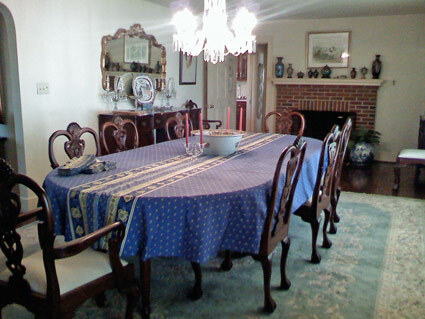 The border pattern was used to create a built-in runner. 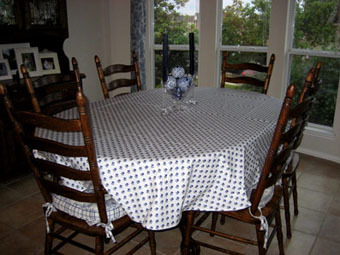 Any cloth can be made "umbrella friendly"
Choose the fabric you like and the cloth shape and dimensions to suit your table. 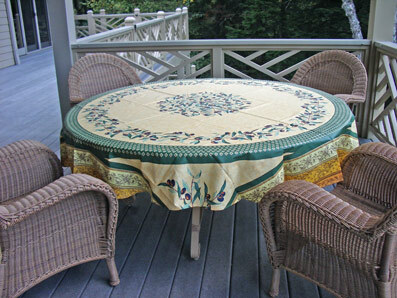 We can make 80" round cloths and over. 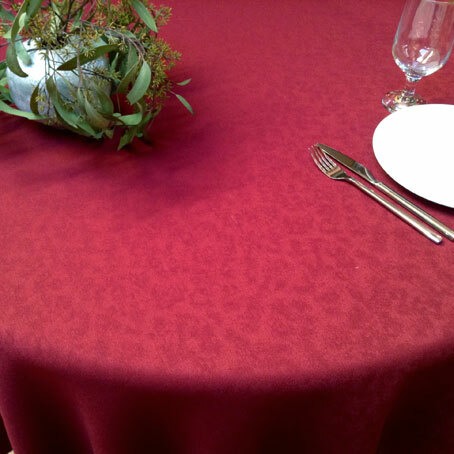 We have several ways of making 80 inch, 90 inch round tablecloths or even 110" or more round tablecloths depending on the diameter required and the chosen fabric. 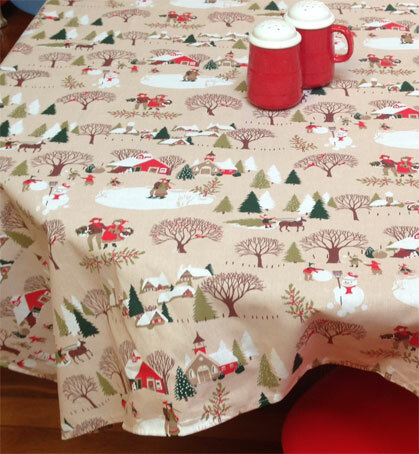 The cloth on the left was made for Gordon and Dianne, Arizona. 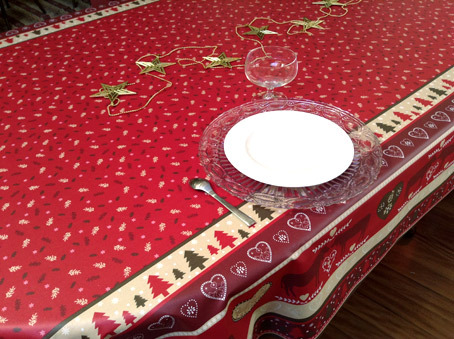 This cloth is made of a 70" (180 cm) square panel with added side pieces of the same material to get the required 90" diameter for this beautiful acrylic coated round tablecloth. 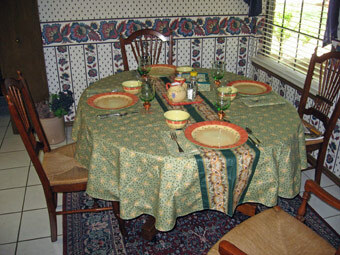 The above custom-made tablecloth now "lives" at Dianne and Gordon's (Arizona). 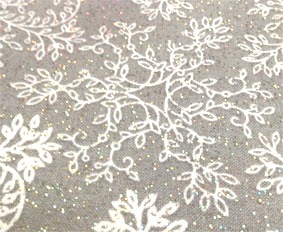 This cloth is made of two different complementary fabrics, one of them being a square pattern, the other one an-all over fabric. 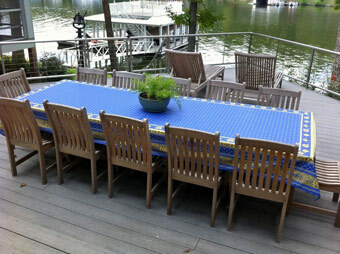 To make this cloth we used a 180 cm / 70" square panel of Elisa provencal fabric with circular design. 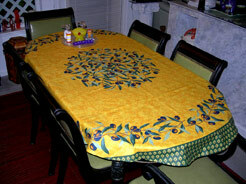 We added a border of Elisa yellow coated fabric to create a 230 cm / 90" square panel. 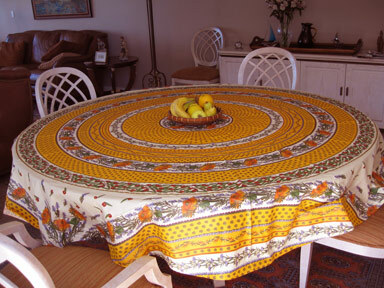 The panel was then shaped round to make a large round tablecloth. 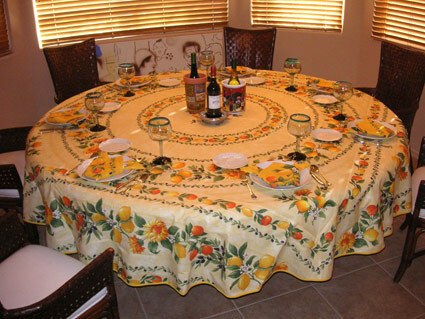 We can use the same technique to make round tablecloths 90" in diameter and above. 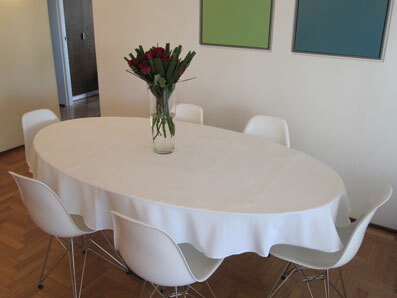 To make this cloth we used a 180 cm / 70" square panel of Laura beige coated fabric with circular design. 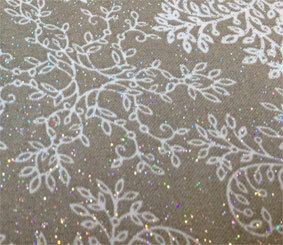 We added a border of Melanie Amber coated fabric to create a 230 cm / 90" square panel. 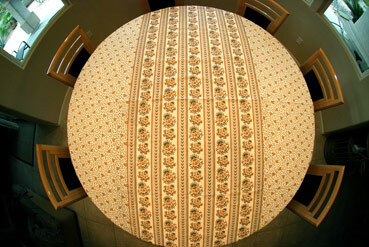 The panel was then shaped round to make a large round tablecloth. 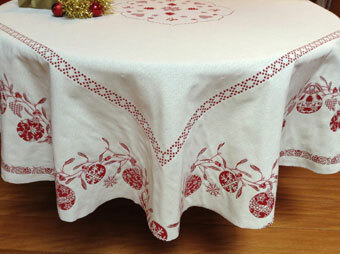 We can use the same technique to make larger round tablecloths. 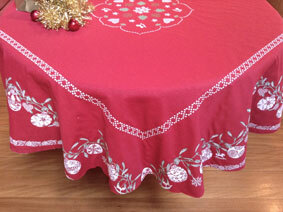 This extra large round tablecloth was made for Lillian and Mike (Las Vegas). 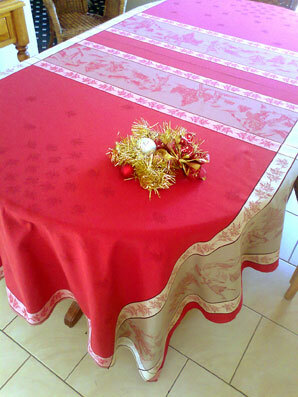 It is made of two different fabrics using the built-in runner technique. 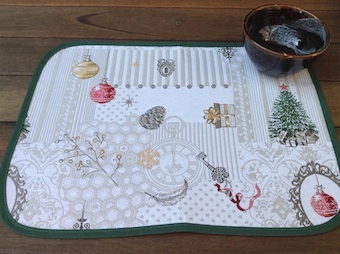 The Provencal fabric for the main part of the cloth has an all-over design (Esther beige) and the fabric for the runner has a striped design (Julie beige). 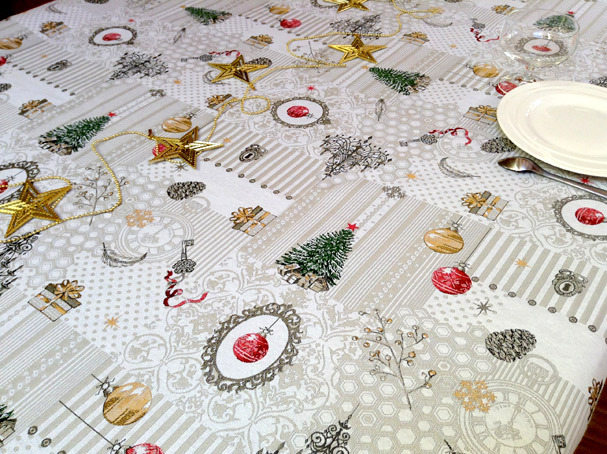 These materials are 150 cm / 59" wide. 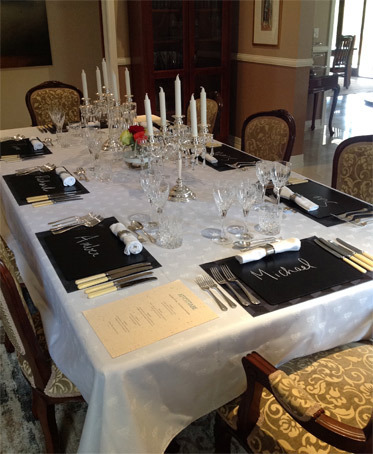 By using the built-in runner technique, we were able to make this 240 cm / 88" large round tablecloth which looks beautiful and sophisticated. 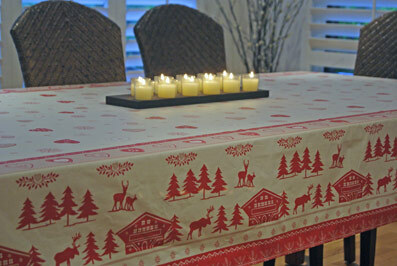 We can make tablecloths of any size using the built-in runner technique. 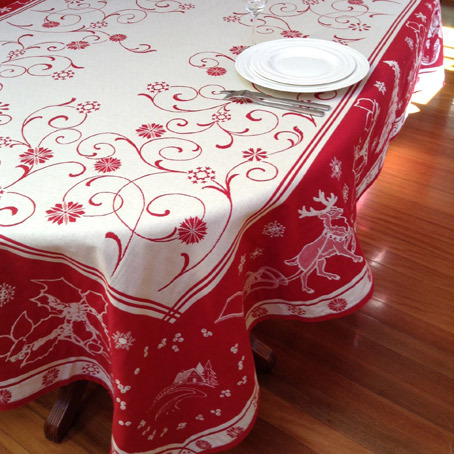 The toile de Jouy fabrics are 280 cm wide (110" wide). 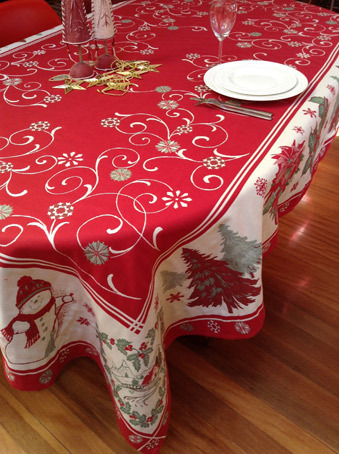 They are particularly well suited for large round tablecloths, square or rectangular. 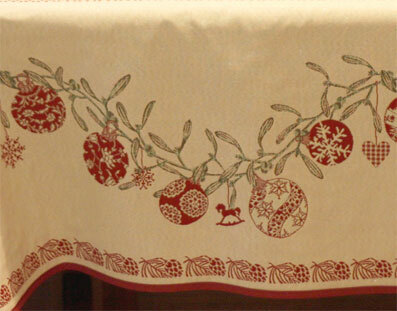 We obtained the required width for this cloth by joining two pieces of Bastide Lavande fabric, using the border pattern to create a built-in runner. 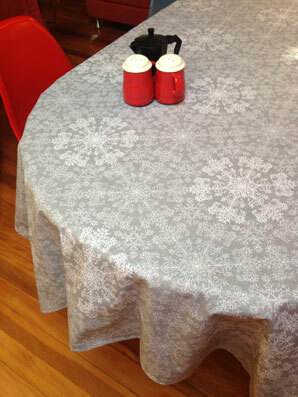 Fully oval tablecloth at Matt's, Sydney. 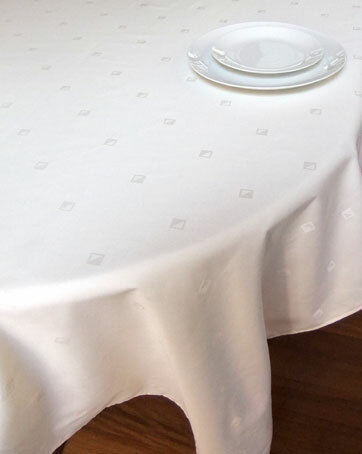 This large, easy care, white polyester tablecloth has been made in one length of our white polyester fabric with cottony feel. 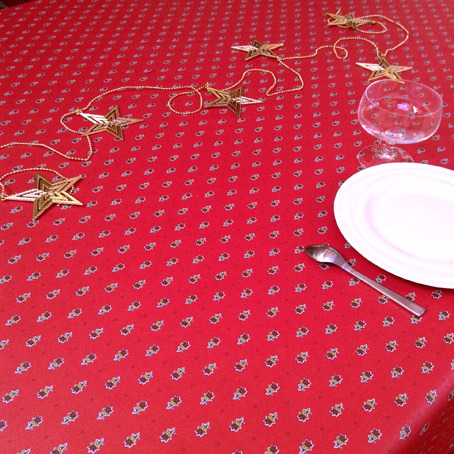 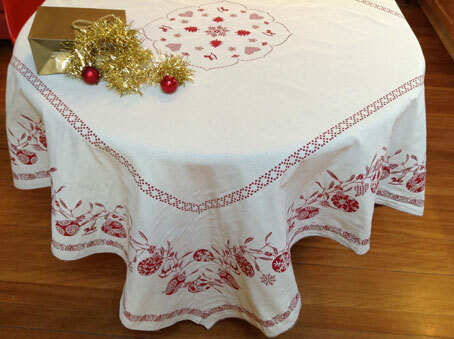 Shirley's custom-made oval tablecloth (USA), taking advantage of the beautiful Laura pattern. 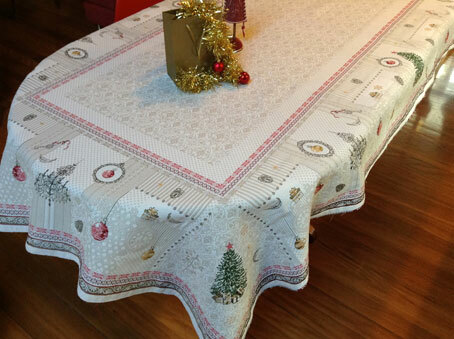 This cloth was made by cutting into an oval shape a standard Laura gold 180 cm / 70" round cloth. 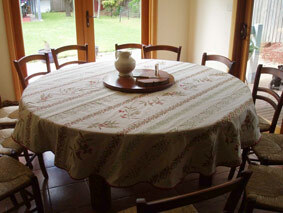 90" round tablecloth custom-made to suit Jody's large round table (New Jersey). 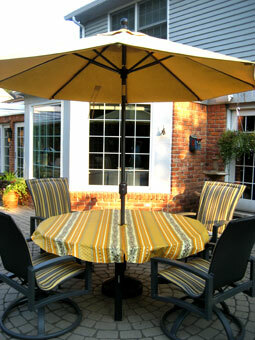 Denote that is is a striped pattern that we used for this round cloth. 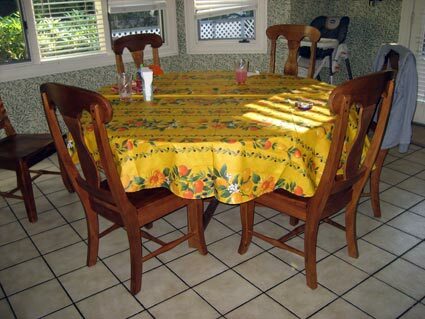 Because Chantal yellow fabric is 59" wide, we've joined two pieces of material together to make this large round cloth and it looks terrific on Jody's large round table. 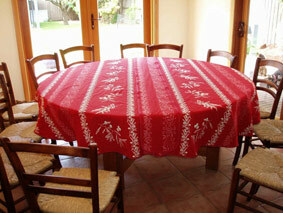 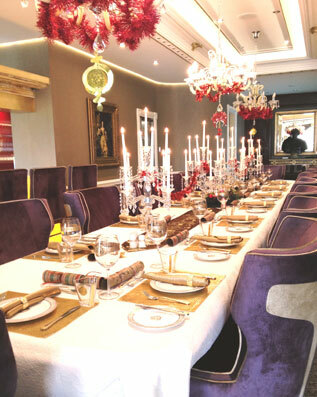 12 seater Bastide Lavande coated, umbrella friendly tablecloth with full border. 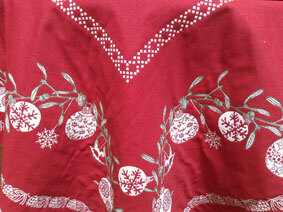 This is done by sewing a strip of the border pattern accross the short sides of the cloth. 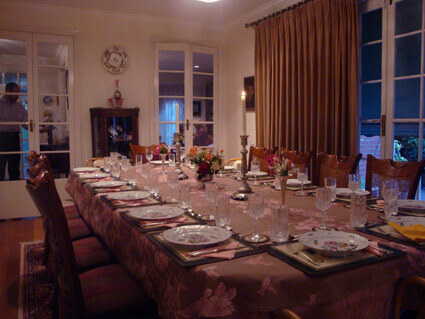 The border "frames" the table. 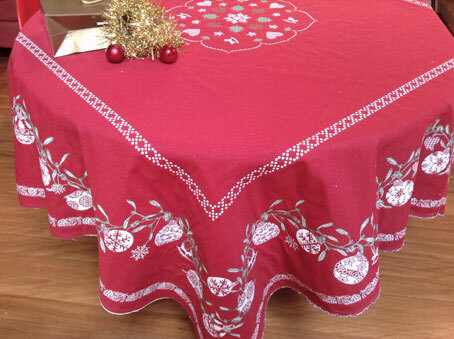 We joined two pieces of Auriol pique fabric to make this large round tablecloths. 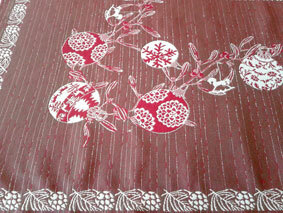 A runner covers the join on the reverse of the cloth (red side) so that the cloth can be used on both sides. 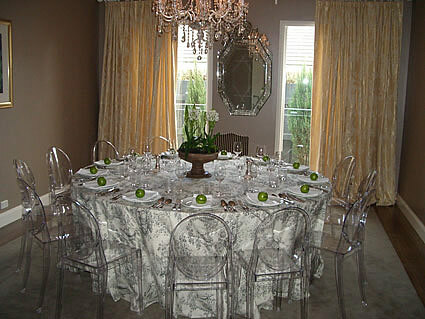 We can custom-make tablecloths in this design - Email the dimensions of your table and we'll give you a quote.